The Control arm (steel), the large bushing (rear) plus nut, also the 3 bolts,washers & nuts used to attach the ball joint. 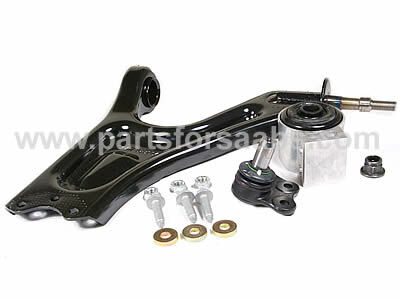 The kit also includes the ball joint, however please note that whilst the rest of the kit is compatible with all models 1998 to 2006, **the balljoint is only suitable for use with 1998 to 2001 models**. Despite this, this kit is still considerably cheaper than buying the arm on its own for 02'-06' models!